We had a big crowd of 25 or so people including several kids (and many adult kids). It was a great evening of building and modding cars and hanging out with MINI friends. Huge thanks to Ridemakerz for having us for the night, and Francis for coordinating and organizing the event!! Send links of pictures to steve@chicagominiclub.com and I will add them here. Also, check out the RideMakerz Flickr Site and feel free to join the group and share your photos with them. The 7th Annual MINIs On The Dragon (MOTD) will be taking place on April 29th thru May 3rd. Drive some fantastic roads and hang out with 600 of your closest MINI friends. 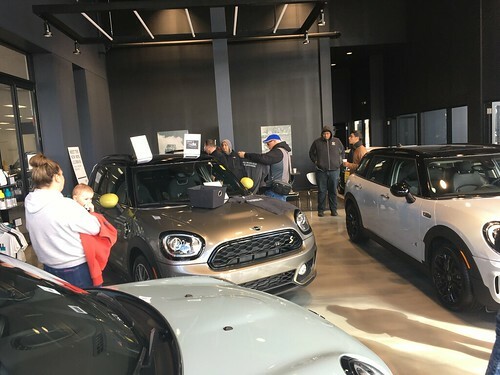 Who is going from the Chicago MINI Motoring Club? Add a comment, and maybe hook up with someone for the trip. Be sure to e-mail links to pictures of your trip to steve@chicagominiclub.com and I will add them here after the event!! WRAPUP: We had a fantastic day to hang out and have our MINIs upgraded.. Intakes, Exhausts, Pulleys, swaybars, undercarriage braces, camber plates, suspension bushings, injectors and dyno tunes.. Waylen and Matt did it all. Lots of people stopped by to check out all the action including many new people, and lots of friends from as far away as Milwaukee and Madison Wisconsin. Everyone enjoyed the cookout of burgers and dogs, and the chance to check out the undersides and guts of our MINIs. Huge thanks to Waylen and Matt from WayMotorworks for coming out and putting in a really hard day of work. Waylen thoughtfully had enough spare inventory with him to take care of several unexpected problems and additional requests throughout the day. Also huge thanks to CMMC club member Dan for opening up his shop, Import Service Center on an off day, supporting Waylen, and making everyone feel welcome for the 13+ hours we hung around. Big thanks also to Jenny and Francis for all the planning, coordination, and getting and cooking the food!!! WRAPUP: Fantastic weather made for a great weekend at the track. The Windy City BMW club did an excellent job with organization, attention to details, safety, and making sure everyone had a good time. There were 5 or 6 MINIs participating and they are hoping for more in the future. This is a wonderful way to learn what you and your car can really do in a safe and controlled environment. The Windy City BMW club is hosting a two day Driving School at Gingerman Raceway in South Haven Michigan on June 27th and 28th. This is the perfect chance to improve your general driving skills and also experience the thrills of driving on a race track. Over 30 cars showed up on a beautiful spring evening to take a short cruise and hang out. The cars drew quite a bit of attention both along the route and at SuperDawg. We had club members attending from as far away as Springfield, Milwaukee and Elgin/St. Charles area. Our friends from Knauz MINI stopped by and dropped off some MINI SMints! It was very cool to have almost the entire SuperDawg parking lot filled with MINIs, Classic Minis, plus even a Morris Minor. Huge thanks to SuperDawg for letting us take over their place for the evening, and for being so accommodating to us in terms of parking and hanging out!! Please e-mail links of pictures to steve@chicagominiclub.com and I will post them here.